Please join us for the 7th Annual Phoenix Rising 5k & 1 Mile Fun Run! Proceeds from this race benefit Crisis Line & Safe House of Central Georgia’s Sexual Assault Victim Advocacy Program. The program supports victims of sexual violence as they heal and grow from victim to survivor. 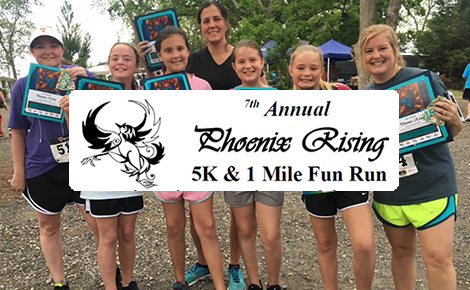 2019 7th Annual Phoenix Rising 5K and 1 Mile Fun Run Race! Sexual assault thrives in silence. Come and be a part of the solution! You don’t have to be a runner to enter, you just need the desire to make a difference. Walkers are welcome! The race begins at Reflections Psychotherapy at 183 West Clinton Street. From Macon – Take Hwy 129 N (GA 22E), turn right on Stewart Ave (in Gray), parking will be at the Civic Center which will be on your left. From Milledgeville – take GA 22W, turn left on Stewart Ave. parking will be at the Civic Center which will be on your left. On-site registration is available–arrive early!